The Drop Lunge Exercise is a great way to improve the mobility and stability of your hips, glutes and iliotibial (IT) bands (the outsides of your thighs). This will enhance your golf performance, help your lower body to absorb shock and to store and release energy. It will also reduce the chances of injury to your knees and lower back. The Drop Lunge Exercise needs practice to achieve proficiency, it requires single leg balance and lots of hip mobility – which is why it’s great for your golf swing. The more you struggle with the Drop Lunge Exercise, the more you need to include this essential movement pattern in your training program. The Drop Lunge Exercise forms part of the Golf Stability series of innovative and dynamic exercises that will build stability in your joints and core for better consistency and ball-striking. Start by standing in perfect posture with your feet shoulder-width apart, and your arms extended out in front of your chest. Reach back with your right foot until it is about 2 feet (60 cm) to the outside of your left foot, allowing your hips to rotate as you do so. Rotate your hips back to square and push them back and down into a full squat. Keep most of your weight on your left foot. 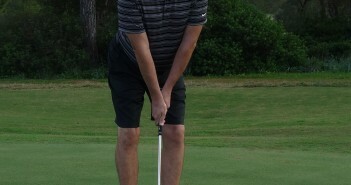 Drive off your left leg to stand back up, and step back with your right foot to the starting position. Repeat for the desired number of repetitions on one side, before switching and repeating on your other side. Keep your chest up and your abdominal muscles engaged. Do not let your front knee slide over your toes. If you find that one side is more proficient than the other, perform extra repetitions on the limited side in an effort to train away the movement asymmetry. You should feel it working your hips and glutes and stretching your iliotibial (IT) bands (the outsides of your thighs). You don’t need to add any additional resistance to this exercise, but once you can perform it easily, with perfect form, you may wish to load it with a medicine ball or with a dumbbell – choose a weight that makes the movement challenging, but enables you to complete all of your repetitions (reps) with proper form. See How Much Weight Should I Lift? for more information. 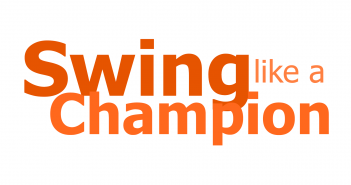 There are a number of other lunge exercises in the Golf Loopy Train like a Champion System that offer a variety of challenges, you can see them all by clicking here.